Fan-out modules distribute the timing signal generated by an Event Generator to an array of Event Receivers. The Fan-Out Concentrator module provides both a fan-out and a concentrated backwards channel from the EVRs towards an EVG. 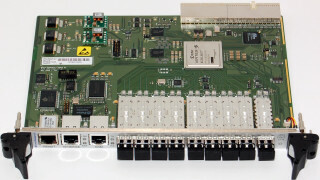 Two-way communication was introduced with the Modular Register Mapping which is currently available for the CompactPCI/PXI and PMC form factor modules. The Fan-Out Concentrator operates as a one in - eight out fan-out and eight in - one out concentrator. Events, distributed bus bits and data buffers are concentrated and sent further towards the EVG.